After a frenetic few days in Las Vegas with its over-the-top everything, the peace and tranquillity of Rancho Valencia near San Diego is soothing for the soul. And, after a few days of lavish pampering mixed with some healthy exercise, ample relaxation and food straight from the manna from heaven cookbook, all senses are truly sated. Rancho Valencia is the only Relais and Chateaux property in Southern California, made Conde Nast's Hot List showcasing the best new hotels in the world and was named as the best tennis ranch in the USA by readers of Tennis Magazine. That is impressive, considering the resort has not been open long following a US$30million, 10-month renovation. 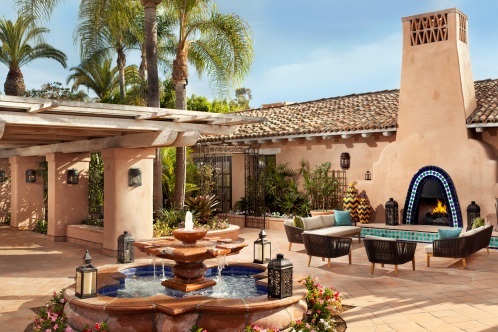 Located in the leafy, wealthy suburb of Rancho Santa Fe, Rancho Valencia has 49 suites and villas including a three-bedroom hacienda complete with private pool, secreted on 45 acres of eucalypts, landscaped gardens, olive groves and citrus trees. Our villa - or casita - is something special, with it's own private garden complete with jacuzzi, outdoor fireplace and sitting area. There are some interlopers in our garden; hummingbirds, butterflies and other birds going about their business, adding to the Garden of Eden effect. Inside, there is a sunken lounge room, entry foyer, an immaculate bedroom and one of the best bathrooms we have seen, with a deep bath, dual basins, a walk-in robe and a space-age toilet with enough buttons to pilot a small plane and a heated seat that rises when you approach it. The bed is a masterpiece, boasting 600 thread-count sheets by Lisa Galimbierti and a mattress made to order by Stearns and Foster in Italy. In fact most things were custom made to ensure everything is just right; even the orange juice left outside the door every morning is freshly squeezed from Valencia oranges grown in the orchard. Chef Eric tells us, during a cooking class, that 'you eat with your eyes first,' and his delectable dishes reflect that. Using home-grown and local produce is key with Executive Chef Eric Bauer, who creates divine dishes in the Resort's restaurant - Veladora - and in the more casual, yet very chic Pony Room. Eric tells us during a cooking class, that "you eat with your eyes first," and his delectable dishes reflect that. Thankfully, they taste as good as they look. We dine inside Veladora under its vaulted timber ceiling and outside in the courtyard with the gurgling of the fountain and the flickering orange glow of the outdoor fireplace adding ambience. We also try out Pony Room during a lingering lunch and love, love, love the gorgeous high-backed bar stools which have delicate little hooves on each leg and the RV brand emblazoned on the back. The bar staff wear designer jodhpurs, crisp white shirts and riding boots and the walls are bedecked with pictures of thoroughbreds. For something different Pony Room has over a hundred tequilas available and offers tequila tastings with in-house expert Chris Simmons giving us quite an education on the smooth, 100 percent agave tequilas around today. With so much great food, fine wine and tequila to be enjoyed, it's just as well that there are a lot of sporty endeavours to be enjoyed. The Resort is famous for its tennis, with 18 courts, professional coaches and a tennis club that has Bill Gates on its books. During my half-hour lesson I picked up some good tips on my backhand and serve which were rusty to say the least. If tennis isn't your thing it's a wonderful area to ride the Resort's bikes around or you can play golf at the prestigious Farms Golf Course - using Calloway Clubs - or do some laps at the Spa's pool. ...the signature treatment I choose, the 90-minute Sixth Sense, is all kinds of heavenly. The Spa is one of the best I have seen, with a very zen-like feel. It is completely separate and is fitted out with ten treatment rooms with a private outdoor area and bathtub, a beautiful yoga pavilion with lily-clad reflection pool, hot and cold pools in private nooks and crannies, a pool, a hi- tech gym, Pilates studio and spin room. Everywhere, beautiful gardens and water features add to the experience. The spa menu has it all for pampering pleasure and the signature treatment I choose, the 90-minute Sixth Sense, is all kinds of heavenly. No wonder Julio Iglesias is a fan. Tiger Woods, Bill Clinton, Michael Jordan, Gene Wilder and Sugar Ray Leonard have all experienced Rancho Valencia but the real stars here are the staff. From the get go, everyone is attentive, friendly and engaging without being in your face. The service is truly exceptional, delivered seamlessly and, when it comes to housekeepers and gardeners, invisibly. Another big plus for Rancho Valencia is its proximity to the beaches, attractions and restaurants of San Diego, from the animal attractions of Sea World, San Diego Zoo and Safari Park to the cool vibe of the Gaslamp Quarter and the beach chic of La Jolla and Coronado. Borrow one of the Porsches available for guests to use and go for a drive. Windows down, radio on, the sea breeze blowing and the California sun shining. Ultimate Luxury: Taking a Porsche for a spin, with the correct insurance of course. Most Indulgent Moment: Having not one massage, but two. Who could resist? Insider Secrets: Play tennis. Lots of tennis. You might bump into Bill Gates. The Little Things: All the little things are done so well here, from housekeeping ensuring your villa is absolutely spotless to the fresh orange juice every morning. Junior Luxies: Kids are VIPs here with plenty of activities and a menu that even the fussiest child will be happy with. Dress code: It's California people! Smart casual is fine or bling it up if you like.